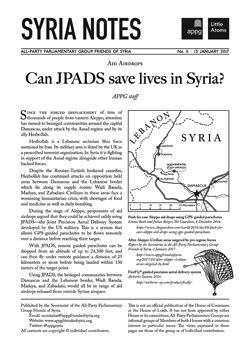 Can JPADS save lives in Syria? Since the forced displacement of tens of thousands of people from eastern Aleppo, attention has turned to besieged communities around the capital Damascus, under attack by the Assad regime and by its ally Hezbollah. Hezbollah is a Lebanese sectarian Shia force sustained by Iran. Its military arm is listed by the UK as a proscribed terrorist organisation. In Syria it is fighting in support of the Assad regime alongside other Iranian backed forces. Despite the Russian-Turkish brokered ceasefire, Hezbollah has continued attacks on opposition held areas between Damascus and the Lebanese border which lie along its supply routes: Wadi Barada, Madaya, and Zabadani. Civilians in these areas face a worsening humanitarian crisis, with shortages of food and medicine as well as daily bombing. During the siege of Aleppo, proponents of aid airdrops argued that they could be achieved safely using JPADS—the Joint Precision Aerial Delivery System developed by the US military. 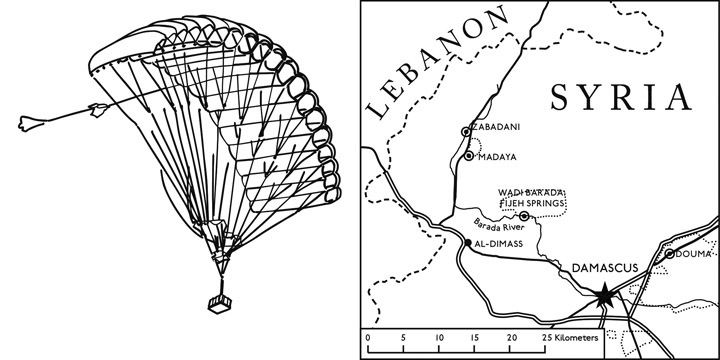 This is a system that allows GPS-guided parachutes to be flown remotely over a distance before reaching their target. With JPADS, remote guided parachutes can be dropped from an altitude of up to 24,500 feet, and can then fly under remote guidance a distance of 25 kilometres or more before being landed within 150 meters of the target point. Using JPADS, the besieged communities between Damascus and the Lebanese border, Wadi Barada, Madaya, and Zabadani, would all be in range of aid airdrops released from outside Syrian airspace. Issue No. 12 of Syria Notes takes a look at technical solutions for safe airdrops to besieged areas between Damascus and the Lebanon border. Ireland’s Senator Ivana Bacik writes for the APPG on her experience of a recent visit to Ireland’s parliament of a pro regime delegation. APPG staff share research on how Syrian refugees in Lebanon view their prospects. Also included are articles by Lina Khatib and Haid Haid of Chatham House, and Sulome Anderson of Newsweek, updating on the implications of the fall of Aleppo for the wider conflict.